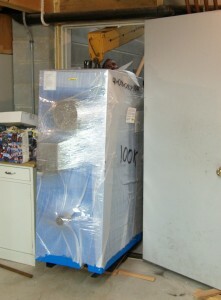 FOM Systems, Inc. is happy to announce that the first phase of our energy upgrade is complete. 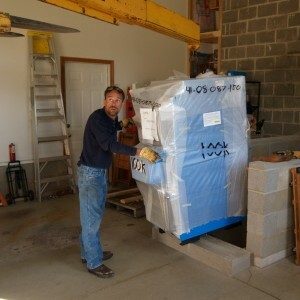 Our wood gassification boiler is up and running, and working like a charm! We had a late Indian summer this year which lasted until all the pipework and post installation operations were completed, with time to spare. So far we seem to be using about the same amount of wood daily as we had previously when we were simply firing a wood stove, but now the entire house is warm, not just the downstairs, plus we have a virtually unlimited supply of domestic hot water. We are still experimenting with the boiler firing rate, and yes, it is possible to put too much wood in at one time, as well as too little it seems. 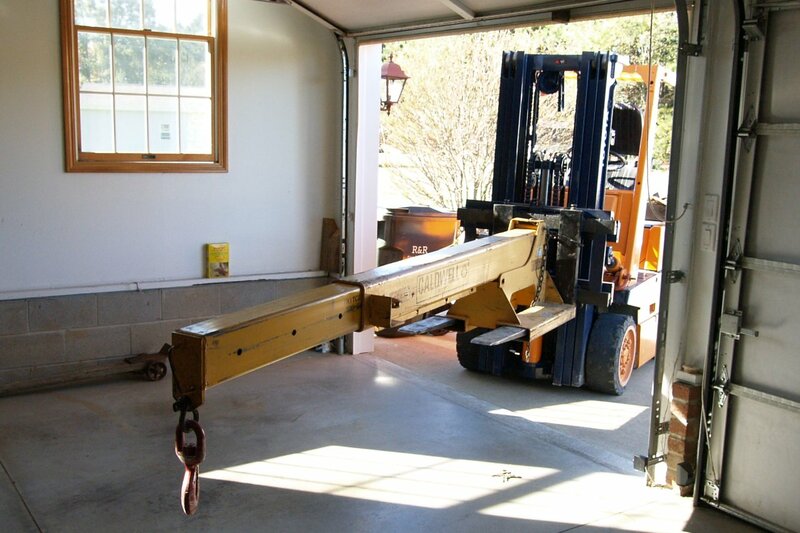 So, how does one move a 1700 pound piece of machinery up one and down 16 steps through a narrow stairway and into the basement? Very carefully! Step one is to gather the right equipment. 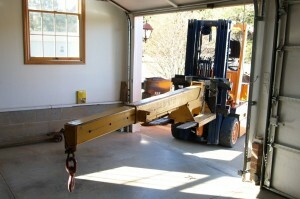 Russ brought his forklift with an extension beam on it. At the distance we needed the moment arm was calculated to be able to lift about 3100 pounds so we decided this was the best option to use to get the boiler downstairs. Can we get it through the door??? 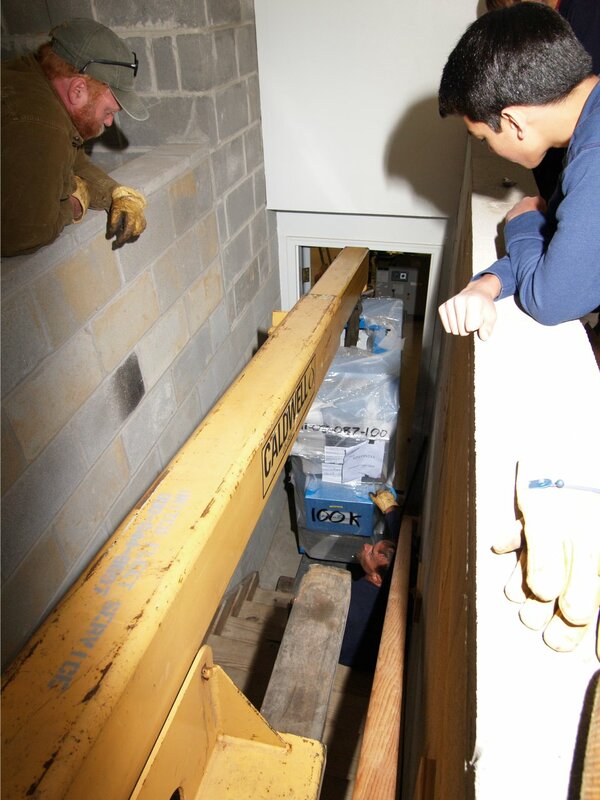 With a bit of head scratching, adjusting the beam, and a change of the clevis securing the lifting ring of the boiler to the beam, we were able to get the boiler through the door and set it flat on the basement floor, with essentially no room to spare up and down. There was plenty of side clearance to get through the door. Boiler just barely fits through the door, with the beam attached. Once we were able to get the boiler sitting on the floor inside the door, moving it around inside the basement was simple using a couple of skates and a Johnson bar. But anyway, that was the end of the most exciting part of the whole affair. We still had a lot of plumbing ahead to connect the boiler to the new storage tank and the existing radiant system. Today, July 10, my family and I took a trip to western New York state to visit the Brocton factory of Dunkirk Metal Products. This is where their line of wood gasification boilers is produced. 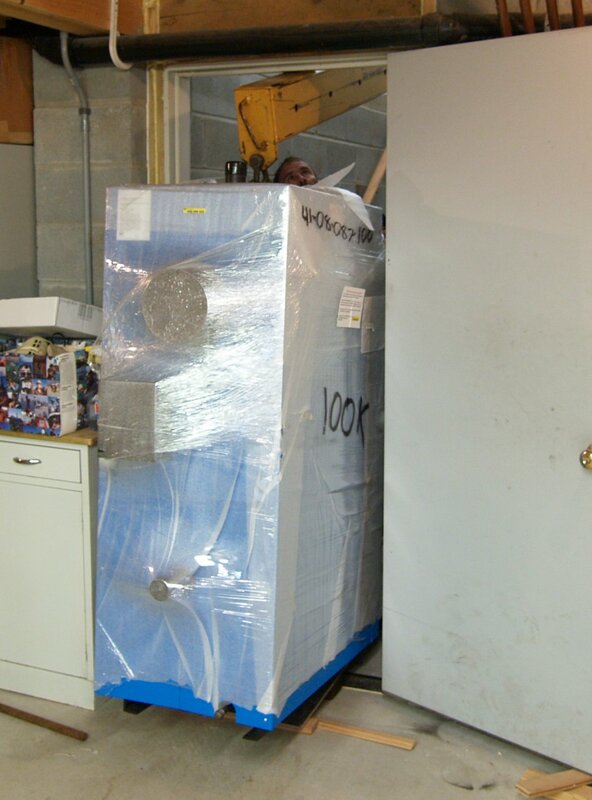 Alternative Fuel Boilers, LLC has been mentioned in earlier posts in this thread. I noted that we were contemplating the model EBW-100, a 100,000BTU unit. As with European style gasification boilers, peak efficiency is reached by maximizing the time that the boiler spends in the “secondary combustion” stage for a given load of wood. This necessitates the use of a large hot water storage tank to soak up the excess energy from the boiler beyond what the house currently needs so that heat can be later drawn from the tank as needed. This also greatly simplifies the addition of a domestic hot water loop and even a supplemental solar loop. The control system of the EBW-100 however allows this particular boiler to be used in a tankless system as well, making it essentially a drop-in replacement for our current oil fired boiler. Once heat demand for the house has been satisfied, the combustion air blower shuts down and the fire dies back. The ceramic refractory retains its heat so when heat is needed again the boiler relights almost instantly (provided there is sufficient fuel remaining) when the fan is restarted. While somewhat less efficient than the system with storage tank, it’s still much better (and cleaner) than the typical outdoor wood furnace. Plus, all heat that does not go up the flu ends up dissipating into the house. We still have not solved the storage tank issue, and it’s starting to look like this might be a custom project all unto itself. But it’s nice knowing that it can be added later and we can build the system in stages rather than trying to do it all at once.